ReadySetAuction offers a comprehensive software solution for your silent, live, mobile, and online fundraiser auctions. 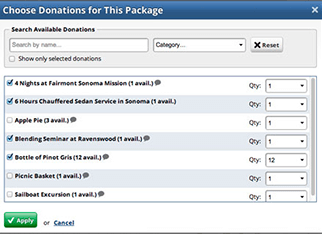 Once the auction is over, you can integrate the data into your DonorPerfect donor management system with just two clicks. A one-stop auction solution from procurement through wrap-up. Track all donations, including items, services, sponsorships, cash, in-kind, and consignment. Bundle donations into packages for bidding, fixed-price sales, buy-in parties, and more. Email or print donor receipts, saving time, hassles, and money. Manage RSVPs, tickets, tables, and meals, and even track the guests of attendees. Conduct mobile bidding and watch your proceeds grow! Effortlessly print your catalog, bid sheets, gift certificates, and displays for your traditional paper auction. Full-Featured cashiering, including self-checkout option and emailed receipts. Export all of your information for easy integration with DonorPerfect. Can we use our SafeSave Merchant Account? Yes! When you link your organization’s SafeSave Payments merchant account to your ReadySetAuction account, your auction staff can capture credit card information at check-in, eBidders can self-pay via credit card, and your auction staff can accept credit card payments at checkout from any bidder. How does ReadySetAuction integrate with DonorPerfect? ReadySetAuction uses DonorPerfect’s free Import Module to bring in data files pre-labeled to match DonorPerfect fields so data is mapped perfectly. The import takes just moments, and eliminates all data entry. How do mobile bidding auctions work? With ReadySetAuction, your venue simply needs a robust Wi-Fi network and/or strong 3G/4G/LTE cellular signals. Bidders can use their own smartphones and tablets to browse your auction catalog, place bids, make purchases, donate money, and check themselves out (so there’s no expensive equipment for you to rent or buy). Since the ReadySetAuction mobile bidding platform is delivered to bidders via their smartphones’ built-in mobile browsers, there’s no app to download. Shared Bidding Stations and Proxy eBidding enables all your guests, including those without smartphones, to participate! Supporters need not even be at your event – they can bid from anywhere – which means you can even hold online-only auctions! Call 800-220-8111 or click here for a FREE consultation.